Look, he's blowing you a kiss. Pics by Nicole Ankowski, more below. Let’s break with format and jump straight to the set list, since that’s what you’re curious about, right? So. 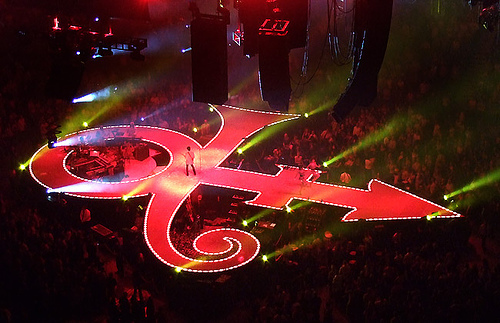 The first show of Prince’s bizarre Izod/MSG-straddling run here begins with the very recent “Laydown,” a/k/a the “From the heart of Minnesota, here comes the purple Yoda” song, tonight rendered as a noisy funk-metal dirge designed to make you real nervous. Prince could obviously play fantastic songs you know and love for six hours straight, or bewildering fusion-medley cacophony for roughly twice that long, and half the fun is worrying about this possibility. Though other initial signs are positive tonight — he emerges via moving platform through the floor of a stage shaped roughly like this, he looks fantastic, he’s immediately lithe and spry and thoroughly enjoying himself — ‘Laydown,” with its double-time punk-rock breakdown and general air of insanity, portends ill. The most notable stage banter of the evening sheds a bit of light on why this is called the Welcome 2 America tour: “Welcome to America, y’all. Where you can fail at your job, get fired, get rehired, and get a 700 billion dollar tip.” OK then. The night’s overall highlight is “Kiss,” of course, because “Kiss” is inevitably the highlight of anything that involves “Kiss,” especially since he changes the lyrics so now it’s “You don’t have to watch The L Word to have an attitude.” The night ends (right at curfew, he points out, perhaps to explain why he doesn’t get around to “Let’s Go Crazy” or whatever) with the vixens pulling some folks from the crowd onstage for a semi-dance party, a “Le Freak”/”Housequake” mashup as appropriate a way to end this as any. His parting words: “This is my house now. Good night.” No arguments. Better Than: When I saw Prince in 2001 at a hockey arena in Columbus, Ohio, a chaotic, medley-besotted show that compelled me to write a lukewarm review deemed so offensive by one fan that she sent me a handwritten letter alleging that I was unable to sexually please a woman, and that my jealousy re: Prince’s clearly evident ability to please a woman had driven me to write such a lousy review. The letter was in blue ink, but a few words were in red, and it took me a while to realize that if you just read those words it spelled out YOU ARE ONE MOTHER FUCKER. Yes, this show was better than that one. Random Notebook Dump: The sight of Prince, with the house lights all cut out, bathed, at his request, in the glow of a thousand cell phones, feels sort of anachronistic.